A Sprained Ankle, also known as an ankle sprain, rolled ankle, ankle injury or ankle ligament injury, is a common medical condition where one or more of the ligaments of the ankle is torn or partially torn. 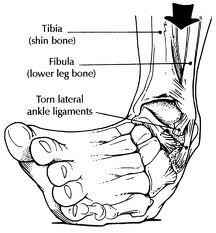 The anterior talofibular ligament is one of the most commonly involved ligaments. A lateral ankle sprain occurs when the ankle is inverted beyond the elastic limits of its supporting structures causing acute ankle pathology. Dr. Michael Horowitz offers a 5-Step process to successfully treating Sprained Ankles. He can help evaluate & diagnose your condition and recommend the best course of action for you. Call Vancouver Orthotics at 604-737-3668 for more information. What is the most effective treatment for sprained ankles? What exercises & stretches do you recommend for sprained ankles? What other symptoms are most commonly associated with sprained ankles? What shoes are best for sprained ankles? Where can I get medical hardware for sprained ankles?